Minister of Railways Shri Suresh Prabhakar Prabhu inaugurated today i.e. 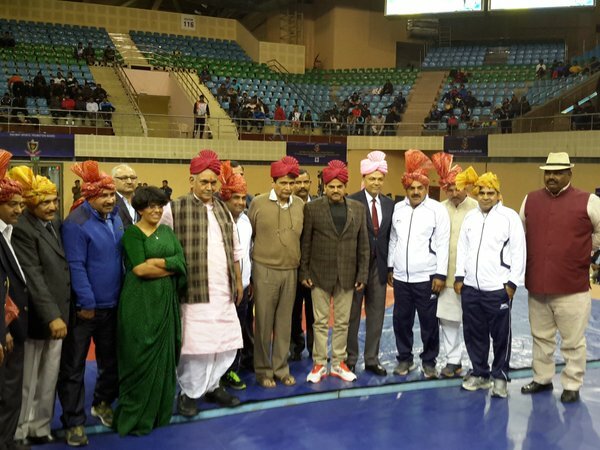 29th December, 2015 the 60thSenior Men Free Style, Greco Roman Style and 18th Female Senior National Wrestling Championships under the aegis of Wrestling Federation of India at Indra Gandhi Stadium Complex (IGSC), New Delhi. The tournament is being hosted by Indian Railways (Railway Sports Promotion Board – RSPB). The Championship is being organized from 29th to 31st December, 2015. The Championship preparation starts from 28thDecember, 2015. Earlier, Indian Railways had organized Senior National Championship in March, 1991 at DLW/Varansi. On this occasion, Minister of State for Railways Shri Manoj Sinha was specially present as a Guest of Honour. Member Staff, Railway Board and President RSPB Shri Pradeep Kumar, Secretary, RSPB Ms. Rekha Yadav, President, Wrestling Federation of India and Member of Parliament Shri Brijbhushan Sharan Singh, other Railway Board Members were among those present on the occasion. Speaking on the occasion, Minister of Railways Shri Suresh Prabhu said that Indian Railways is committed to the promotion of sports and games in the country. Shri Suresh Prabhu said that Indian Railways has also been in the forefront in promoting sports and games for women in the country. Referring to the wrestling Shri Suresh Prabhu said that it is connected with our ancient traditions and we have achieved good results in this game at international level also. In his speech, Minister of State for Railways Shri Manoj Sinha said that the wrestling has been a game of ancient tradition in the country and has moved from rural areas to the urban areas. He said that sports and games are not only means of employment but also provide self respect and good health. He pointed out that Indian Railways has encouraged sports and games in a big way especially for the women. Wrestling is the only individual sport where India won back to back medals in Olympics. Railways boasts of some of the prominent wrestlers of the country. Shri Sushil Kumar was awarded Arjun Award, Rajiv Gandhi Khel Ratna Award and Padamshree Award being the part of Indian Railways. With more than 1200 Wrestlers and officials participating in this event from 30 State/ UT including 2 Boards (Railways and Services), this is one of the biggest sporting event in the National Calender. Wrestling, a very popular sport wherein most of the wrestlers belong to Northern part of the country especially from Haryana. The championship is being organized in Delhi after 20 years. A very large number of spectators from Haryana and NCR is expected in this championship. Normal composition of the team is of maximum 8 wrestlers in each Free Style, Greco Roman Style and Female Wrestling i.e. one player for each weight category. Details of expected no. of players is also enclosed herewith. Women Wrestling team has been raised for the first time in Railways. Last Year Indian Railways Women Wrestling Team participated in the Senior National Women Wrestling Championship with 3 women wrestlers and won two Gold and one Silver. This year 8 women wrestler from IR is going to participate in Senior National.